Correcting an earlier statement, SpaceX said Monday it will still try to guide the first stage to a controlled soft splashdown in the Atlantic Ocean -- "with a low probability of success" -- but the company has no plans to retrieve it. The reason for the changeout was not disclosed, but it means Saturday's flight will be without landing legs. 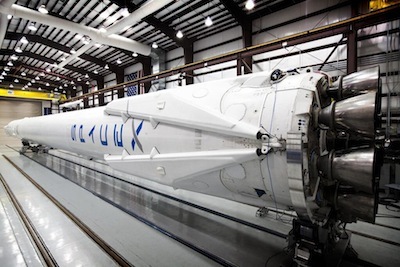 SpaceX fitted two Falcon 9 rockets earlier this year with landing legs. During liftoff, the carbon fiber-aluminum honeycomb legs are left folded against the rocket's first stage. Once the booster finishes its main job in the launch sequence, the stage falls away and uses leftover propellant to re-ignite its engines for a controlled descent back to Earth. Moments before reaching the ground, the legs extend down and outward. The launches with landing legs earlier this year were exercises, culminating with splashdown in the Atlantic Ocean a few hundred miles from Cape Canaveral. SpaceX plans to eventually land its rocket stages on a barge or on shore, allowing engineers to refurbish the hardware for reuse. The next two launches after Saturday's mission will attempt landing the first stage on a solid surface, according to SpaceX. The last two Falcon 9 missions carried large communications satellites to high-altitude orbits, leaving insufficient fuel for a full descent and landing of the rocket's first stage. After the Sept. 7 launch of AsiaSat 6, SpaceX moved the two-stage Falcon 9 rocket for the next mission into the horizontal integration hangar at Cape Canaveral's Complex 40 launch pad. The schedule calls for the cargo-carrying Dragon capsule to be attached to the launcher this week, followed by a customary on-pad engine firing to verify the rocket's readiness for flight. Following the static engine firing, launch crews will rotate the rocket back horizontal to install time-sensitive cargo into the Dragon spacecraft's pressurized cabin. The rest of the ship's cargo load is already packed inside. The supplies to be loaded into the unmanned capsule on the eve of launch include 20 mice serving as experimental specimens for scientists studying muscle atrophy. More than 5,000 pounds of supplies, experiments, provisions and other gear is manifested to fly to the space station on the Sept. 20 launch. The payloads include an Earth observation package for mounting on a platform outside the space station to measure ocean winds. Scientists say the data will improve weather prediction, including hurricane forecasts. If liftoff occurs Saturday, the Dragon spacecraft is due to arrive at the space station Monday. The laser-guided rendezvous will conclude with grapple of the capsule by the space station's Canadian-built robotic arm. SpaceX has to launch the mission Sept. 20 or Sept. 21 or wait until at least Sept. 25 for another opportunity. The space station's next three-person crew -- made up of two Russian cosmonauts and a NASA astronaut -- is preparing for launch Sept. 25 aboard a Russian Soyuz ferry craft, and cargo missions like the SpaceX flight must stand down during crew rotations. The capsule will remain attached to the complex for about a month, then it will be released to descend from orbit for a splashdown in the Pacific Ocean, bringing home about 1.9 tons of experiment samples and other equipment tagged for return to Earth. 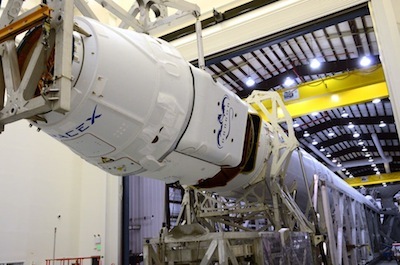 The mission will be SpaceX's fourth operational cargo delivery to the space station. The Hawthorne, Calif.-based company has a $1.6 billion contract with NASA for 12 logistics missions through 2016. NASA turned to the private sector for cargo resupply missions after the retirement of the space shuttle. Orbital Sciences Corp. holds a similar contract with NASA worth $1.9 billion for eight flights with its Antares rocket and Cygnus spaceship, ensuring a steady stream of supplies to the space station with two independent providers.